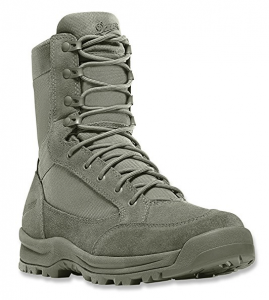 Are you looking for rugged waterproof combat boots that will last you many seasons to come? Then the danner tanicus could be one of best boots you’re looking for. With different climates, having reliable and durable footwear is mandate so that you do not compromise your own comfort. In this review i show you my opinion on these boots. If you are an avid outdoor hobbyist, you can relate to the uneven terrain you traverse through, as well as snowy surfaces that could prevent you from walking at a good pace. To alleviate these inconveniences, you will need tough combat boots made of long-lasting materials with rugged soles for better traction. You need waterproof or water resistant boots to protect against the occasional downpour. To add versatility to these boots, mesh lining is often included to enhance breathability especially in hot weather conditions. The comfort of the boots is yet another factor when searching for the best winter boots. Danner tanicus is a pair of winter footwear measuring 8-inches. The footwear is made of rough-out leather and 1000 denier nylon for an unbeatable durability throughout your hiking journeys. With this quality material, no rough terrain can tear it. Your feet will be protected against the thorns and sharp stones in all sorts of terrains. The materials do not compromise the weight of these combat boots. Featuring a pentagonal lug pattern on its synthetic sole, danner tanicus footwear is made to survive all sorts of slippery roads. After snowfall, it’s likely to find some terrains, especially down slopes, being slippery. The boots’ moisture-wicking and breathable lining is also a good feature. As aforementioned in the introduction, breathability is important to prevent moisture build-up. Whether during summer or winter, our feet can suffer from perspiration. A closed pair of footwear can end up stinking if you wear it for a long time without ventilating it. Other features of these boots include the lace garage that prevents loose laces from snagging. The collar and the tongue are padded to aid in breathability and comfort. The stretch fabric at the top of the tongue helps to tuck the laces so that they do not get dragged. They have made these boots to fit many people with bigger sizes. They are available in different colors. People reported that their seize was too small. It’s better to go for one seize larger than you are used to. The pair is ideal for abuse because of its high-quality materials. It is made to survive the inclement winter conditions with a rugged leather and nylon combined with an extra cushioning in the midsole. And for those hiking on slippery roads, the pentagonal sole can provide better traction. This pair of boots is relatively expensive. So you need to be prepared to invest in it. Nonetheless, its quality materials guarantee durability so you will not have lost your hard-earned dollars. 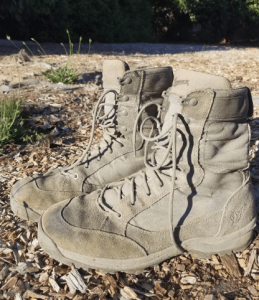 Every enthusiast hiker should consider having at least a pair of combat boots. To check out ratings of other users click here. If you would like to read more about boots, check out our reviews here.